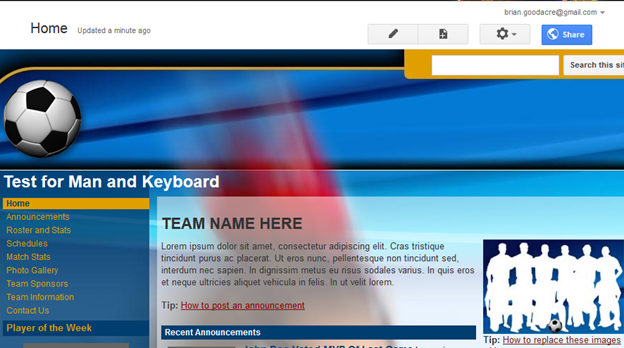 Google Sites has some nice templates. If you are building a site for your sports team, then you probably selected the Soccer Team theme and were happy with the look and feel of the site. If you are not a soccer team though, you will have trouble removing the soccer balls everyone. I was able to successfully do it so here is how to do it. Your site will look like this when you start off but you do not want those soccer images everywhere! 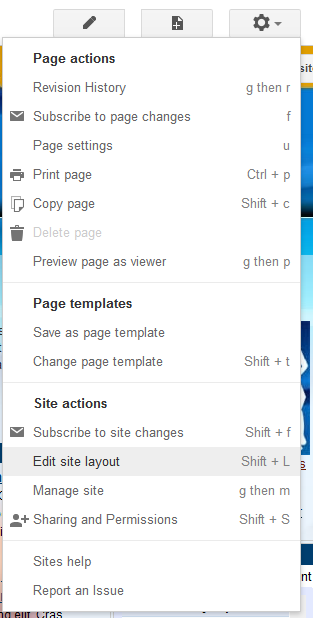 To get rid of most of the annoying images, go to Site Settings (circular screw image) and select Manage Site. In the left menu bar, select Themes, Colors, and Fonts. The minimum you will have to do is change the 3rd radio button below for Background>Wrapper Image to Theme or None to get rid of the background of the soccer player’s leg. 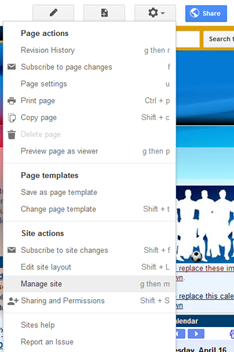 I suggest setting everything to Theme so you can use Google’s color themes to get a nice looking website. Be sure to notice that there are two columns of settings that you should to Theme to take advantage of themes. The first column below is Entire Page, Site Header, etc.. The second column is Background, Text, etc. 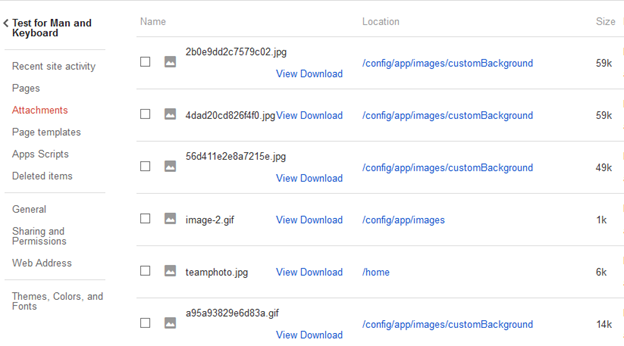 Some other websites suggested deleting the actual image files located in Attachments. I DO NOT suggest this because your website will have broken image links everywhere, which is not pretty to look at. Do as you please. You should those find the image that is favicon.ico and change that to another image of your choosing, probably the ball that you use in your sport. The favicon is the picture that appears in the tab in your web browser. Great right? Nope! 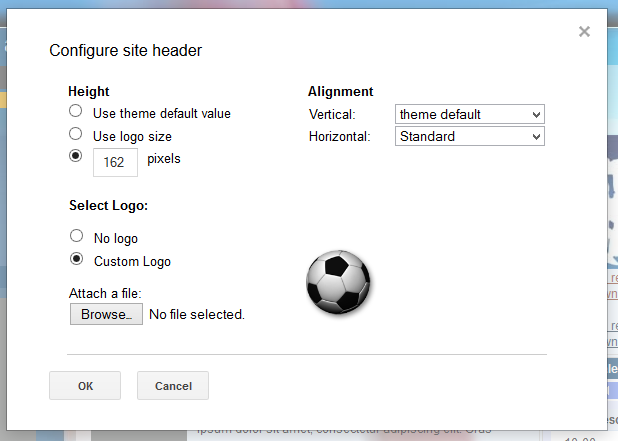 The other helpful links I found online did not explain how to get rid of that soccer ball in the header. Even deleting everything in attachments did not do it. To get rid of it, go back to your front page and select Site Settings (circular screw image) and select Edit site layout. Hover your mouse over the header and click on it. For Select Logo: you can Attach a file or select No logo. I also suggest to Use theme default value for the Height to avoid a funny looking website. Here is what your website will look like after you remove the soccer related items. Notice there are no soccer balls! 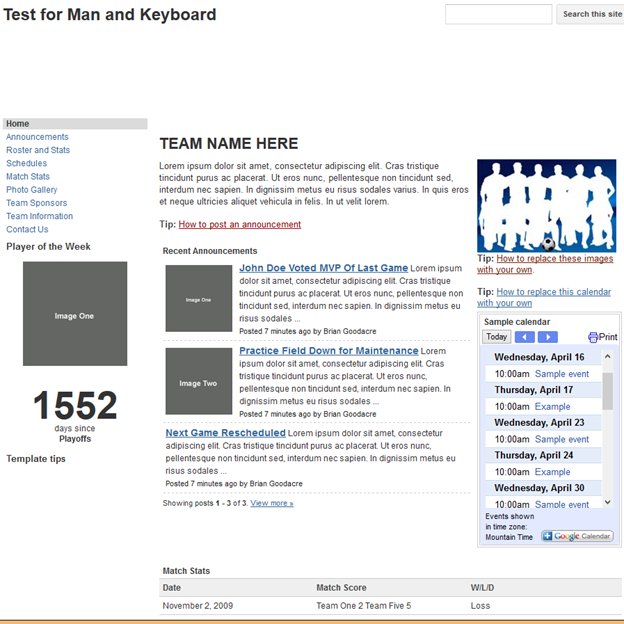 This entry was posted in How-To and tagged Google Sites, tutorial, Website. Bookmark the permalink. do you know if there is a photoshop PSD available of this soccer theme? It looks like there is a single background JPG image and I was about to start hacking away. I’ve only used Google sites once before so I’m not up on their capabilities. Thanks. I do not know. You can try debugging the webpage and grabbing material from there?